It is well hidden by Adobe who really wants to move customers to their yearly or monthly subscription model (see below my chat exchange with an Adobe sales advisor)…. Have you heard about PDF Studio? If you are considering buying an eternal license of Adobe Acrobat, you might also be interested in our desktop application PDF Studio, which is an advanced PDF editor offered at 1/3 of the cost. You will find a chat exchange that I had with a sales advisor at Adobe® Acrobat® regarding the ability to purchase a lifetime / non-subscription license for Adobe Acrobat DC. Even though it is rather hidden, it is still possible to make an “outright purchase”. From chatting with the sales advisor, it is not clear what is included in free updates and how versioning / end-of-life will work for non-subscription purchases…. From the purchase page, it seems that there is still a yearly version number and considering a software life cycle, I am pretty sure that there will be an end-of-life based on this version at some point in the future. Please hold as we route your chat. Hello, welcome to Adobe! My name is ‘Audrey’. 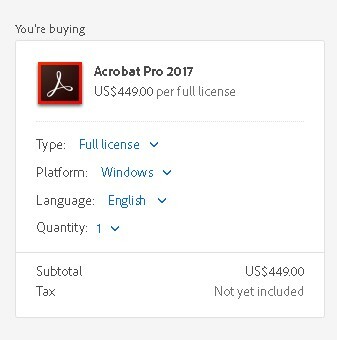 Can I buy a lifetime license for Adobe Acrobat DC? It’s nice to have you on chat. How may I assist you with purchase today? I will be glad to help you with that information. Acrobat Pro DC is available as outright purchase. It will cost you $449. You will get only free updates. But with the subscription plan, you will get upgrades to any new features or new version as soon as available without additional cost. What is the link to purchase it outright? I’ll standby to hear the order number and the order total since it helps me to verify the order and confirm that the order has gone through successfully. Let me help if you face any issue while placing an order . Is your order process going smoothly ? What will be included in free updates? Since we are from online sales team, we do not have information on this. What is the version number on the Adobe Acrobat DC for outright purchase? Acrobat Pro DC is the latest 2017 version. Will this version ever be end of life? Adobe always add new features to enhance the software. If you will purchase subscription plan, you will get free updates and upgrades for free(no additional cost) on subscription as long as the subscription is active. It will cost you $14.99/month annually. My question was about the outright purchase. With outright purchase, you will get only free updates. We do not have information on future version but Adobe is always working to release new features to make software for more user friendly. For ever or will version 2017 be end of life at some point? You can use the outright purchase for lifetime. We haven’t heard from you for a while, would you like to continue with this chat? I understand I can continue using it. But will it be end of life at some point where Adobe stops support and security upgrades on a given version (for instance 2017). You will get free update for lifetime. I am not purchasing immediately. Thank you for your help.